The evidence of entoptic images during the Upper Palaeolithic is abundant. This chapter will not be divided into entoptic form sub-groups, as I have done in the Neolithic section which follows. The Upper Palaeolithic will be treated as a whole, and the evidence from different countries will be illustrated sequentially thus: the U.S.S.R., Siberia and the Ukraine; Scandinavia (Sweden, Norway and Finland); Bulgaria; Spain; France; Germany; Belgium; Italy; Jordan; Israel and India. Figure 12a below, from Skjomen (after Shetelig, Falk and Gordon 1937:101. fig. 5). This illustration depicts a geometric pattern from a rock carving. Replication of chevrons which in turn are fragmentations of entoptic IVa. Figure 12b below, from Jätteböle, Åland (after Shetelig, Falk and Gordon 1937: Plate 13). This is a clay figurine, engraved with dots, which form entoptic Ib. Figure 12c below, from Eliseyevichi, Siberia (after Marshack 1979:283, fig. 27). The image is predominantly composed of zig-zags (entoptic IVa), but also has a branched motif. Figure 13a below, from Eliseyevichi, Siberia (after Marshack 1979:284, fig. 29). This artefact is a fragmented plaque of mammoth ivory. It displays entoptics IIa, IVa, and Va. Figure 13b below, from Eliseyevichi, Siberia (after Marshack 1979:288, fig. 34). Another fragmented mammoth ivory plaque depicting entoptics Ib and IVa. Figure 13c below from, Eliseyevichi, Siberia (after Marshack 1979:278, fig. 16). An ivory plaque showing entoptic Ia in grid form and in the fragmented ladder form, IIa, and IVa as both zig-zags and chevrons. Figure 14a below, from Eliseyevichi, Siberia (after Marshack 1979:280, fig. 20). Ivory fragment showing entoptics IIa, and IVa. Figure 14b below, from Eliseyevichi, Siberia (after Marshack 1979:289, fig. 37). Engraved mammoth ivory depicting entoptic Ib and IVa. Figure 14c below, from Mezherich, the Ukraine (after Marshack 1979:291, fig. 40). Broken spatula of mammoth ivory depicting entoptic IV. Figure 15a below, from Mezherich, the Ukraine (after Marshack 1979:292, fig. 42). Mammoth ivory plaque showing fragmented forms of entoptics Ia and IVa. Figure 15b below, from, Eliseyevichi, Siberia (after Marshack 1979:288, fig. 35). Fragmented mammoth ivory plaque showing entoptics Ib, Ia (fragmented) and IVa. Figure 16a below, from Predmost, Moravia (after Marshack 1991:21, fig. 5). A horned female figure carved from a young mammoth tusk. The geometric design incorporates entoptics Ia (fragmented), IVa (fragmented) and Va. 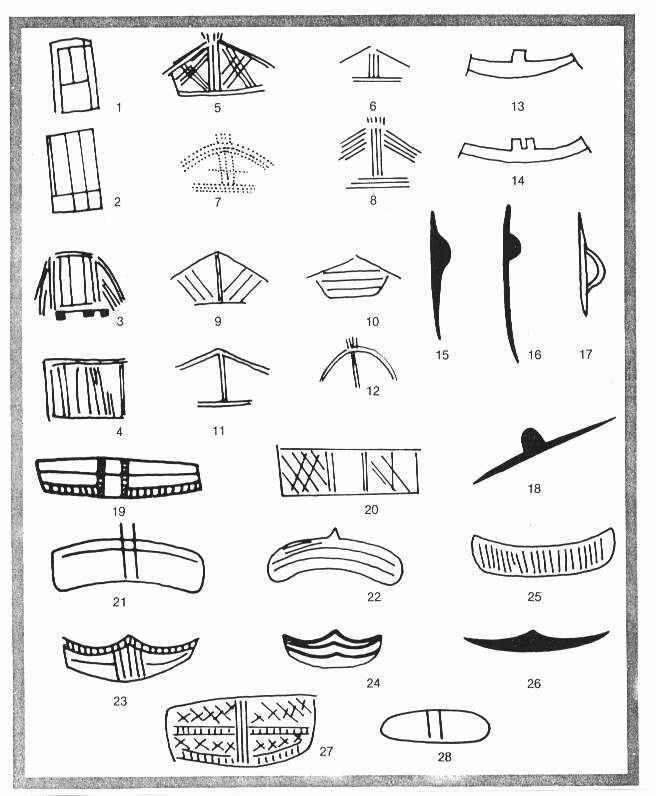 Figures 16b and c below, from Mezin, the Ukraine (after Bosinski 1991: plate 16). Ivory 'bird' figurines showing entoptic Va and IIa. Hunter-gatherer art can be found in central and northern Scandinavia. Human occupation here is thought to have begun as soon as the ice-sheets receded and was established perhaps by 9,000 B.C. Evidence of settlements and camping places is known of, but the evidence has been severely diminished by erosion and decay. These peoples painted the rock of the surrounding cliffs, caves and smoothed surfaces (Coles 1991:130). Some examples of their figurative and non-figurative art follow: Figure 17a below, from Uittamonsalmi, Finland (after Coles 1991:130, fig. 1, left). These Palaeolithic images belong to a painted panel, and depict both animals and humans. Figure 17b below, from Tumlehed, near Göteberg, Sweden (after Coles 1991:130, fig. 1, right). Figure 17c below, from Flatruet, Sweden (after Coles 1991:131, fig. 2). A painted panel depicting elk, deer and some human forms. Figure 18a below, from Resenmose, Jutland (after Clark 1968:168). Figure 18b below, from Pernau, Esthonia (after Clark 1968:164). Figure 18c below, from Svaerdborg, Zealand (after Clark 1968:168). Figure 18d below, from Kalundborg, Zealand (after Clark 1968:172). Figure 18e below, from Limhamn, Sweden (after Clark 1968:164). Figure 19a below, from Mullerup, Zealand (after Clark 1968:173). Figure 19b below, from Svaerdborg, Zealand (after Clark 1968:164). Figure 19c below, from Ostroleka, Poland (after Clark 1968:173). Figure 20a below, from Illebolle, Langeland Island (after Clark 1968:173). Figure 20b below, from Skalstrup, Zealand (after Clark 1968:172). Figure 20c below, from Mullerup, Zealand (after Clark 1968:173). Figure 20d below, from Bohuslan, Sweden (after Clark 1968:168). Figure 21a below, from Vitträsk, Finland (after Coles 1991:131, fig. 3). Painted geometric images from a painted panel, includes entoptic IV in a fragmented form. Figure 21b below, from Bacho Kiro, Bulgaria (after Marshack 1976:277, fig. 7). A Mousterian non-utilitarian fragment of bone showing zig-zags (entoptic IV). Figure 21c below, from Tito Bustillo cave (after Moure-Romanillo and Cano-Herrera 1979:286, fig. 3, no. 6). Showing entoptics IIa and a fragmented IVa. Figure 21d below from Tito Bustillo cave (after Moure-Romanillo and Cano-Herrera 1979:286, fig. 3, no. 2). Showing entoptic IVa Figure 21e below, from Tito Bustillo cave (after Moure-Romanillo and Cano-Herrera 1979:286, fig. 3, no. 5). Showing entoptic IVa and IIa. Figure 21f below, from Tito Bustillo cave (after Moure-Romanillo and Cano-Herrera 1979:286, fig. 3, no. 4). Showing entoptic IVb. Figure 22a below, from Lespugue, Haute Garonne (after Sieveking 1991:46, fig. 6). Engraved bone silhouette of a fish. Figure 22b below, from El Pendo, Santander (after Sieveking 1991:46, fig. 6). Bone spatula. Figure 22c below, from La Vache, (after Sieveking 1991:46, fig. 6). Antler pendant. Figure 22d below, from Isuritz (after Sieveking 1991:46, fig. 6). Antler fragment. Figure 22e below from Laugerie Basse (after Sieveking 1991:46, fig. 6). Evidence of some of the European Epipalaeolithic incised designs. Figure 23a below, from La Pommeraye (after D'Errico 1992:104, fig. 9). Showing entoptic Ia in a fragmented form. Figure 23b below, from Grotta della Madonna (after D'Errico 1992:104, fig. 9). Showing a non-entoptic image. Figure 23c below, from Roc de Marcamps (after D'Errico 1992:104, fig. 9). Showing a fan formation which is similar to those discussed by Whiten, see chapter III, pp.43-44 on primate art. Figure 23d below, from Grotte du Roc (after D'Errico 1992:104, fig. 9). Pendants showing entoptic IIa. Figure 23e below, from Pech de l'Azé, France (after Marshack 1976:279, fig. 12). Engraved rib showing a meander which falls in to the category of entoptic VI. Figure 23f below, from Vogelherd, Germany (after Marshack 1976:275, fig. 3). An engraved animal figurine with zig-zags (entoptic IVa) and catenary curves (entoptic V). Figure 24a below, from Romanillo, Italy (after Marshack 1976:279, fig. 13). Engraved pebble showing a meander (entoptic VI). Figure 24b below, from Urkan e-Rub, Israel (after Bahn 1991:94, fig. 3). An engraved pebble showing entoptics IIa, Ia (fragmented) and Va. Figure 24c below, from Patne, India (after Bahn 1991:95, fig. 6). Engraved ostrich shell showing entoptic Ia. Table 10 showing Leroi-Gourhan's Upper Palaeolithic signs.